Life is hard. I guess those would be the words that would be screaming in my head after hearing from my doctor that I have a deadly form of cancer called mesothelioma. It is not like if I could tell myself, if only you would’ve not smoked or began to smoke. Such is the case with most people who find out they have lung cancer. Things would be completely out of my control. I can’t go back and change the past. I would have to face the fact that I have an incurable disease. After hosting a pity party for myself, I would try to get a hold of myself and see what I could do. Educating myself more about my disease and getting some great positive help for my future would be the first step to getting some control over my situation. This is an attitude that cannot be taken easily, but it could only be done by a hero; someone who has exceptional capabilities who can go against the odds. Such is the attitude James “Rhio” O’Connor demonstrated in his struggle to not be defeated by mesothelioma. Taking the “bull by the horns”, Mr. “Rhio” O’Connor decided he would do all he could to defeat his disease. His first step was to become well educated about mesothelioma. He talked to different doctors, spent numerous hours researching, talking to other patients, and using the tools that were available to him. O’Connor learn that by changing his eating patterns it would make a tremendous difference. He, like most victims of this type of cancer, was exposed to great amount of asbestos for long amount of time. The asbestos he breathe in created cancerous cells in his body, that attack his mesothelium. Mesothelium is an important membrane in the human body whose sole purpose is to protect most of the internal organs. According to www.survivingmesothelioma.com, mesothelium has two layers of cells. The first cell layer has direct contact with the organ while the second layer forms a sac. The problem begins when the asbestos, which are flexible fibers that can be divided into threads, are inhaled and rest on the mesothelium. Asbestos can be found in many industrial products ranging from insulation to cement. Over and over I hear from people around me that I am such a negative person. I can honestly say that there is not a day that passes by without someone reminding me these words. Stories like O’Connor inspire me to look at life with a different perspective. After all looking at life positively can change the way that I feel towards my own personal struggles. My major is social work and from what I have heard this career can be very draining. Whenever I start to practice my career, I have to have the attitude of a hero like O’Connor. There are stories that are told from time to time that inspire people to become better citizens. O’Connor’s story is one of them. Although I would love for life to be a sweet ride the harsh reality is that in fact it is very hard. It can even seam unfair sometimes. I believe that the faster I can accept the fact that life is hard, the faster I can move forward and come up with different solutions to the challenges that life throws my way. One of the greatest advantages that I had over O’Connor’s experience is that I have an inspiring story like his to encourage me to keep moving forward and not give up. 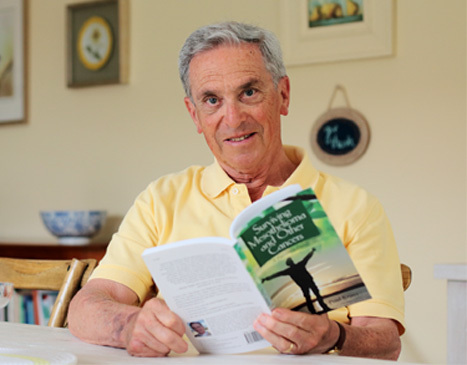 There are also books that have been written by other survivors of cancer explaining what steps can be taken to not give up. To be honest it would be very hard and shocking to be given a dire cancer prognosis. To sit in a doctor’s office and be told that by approximation I had certain amount of days left, is something hard to swallow. As the saying goes,” everybody wants to go to heaven, but nobody wants to die.” I can imagine all I want, but the reality is that I wouldn’t know how I would feel if I had a certain amount of days left in the world. Nevertheless, if I would be faced with the same challenges as O’Connor, my first step would be to use the internet as a resource for all that can be learned about the illness. I would try to find support groups, people that are going through a similar experience with the illness. It would not only give me the strength, but I would be aware of different medical options that are available. If possible, I would also try to arrange a meeting so that some of the people in the support group could meet. It would be an honor for me to count with someone that is going through the same situation and is committed to fight as long as possible. When choosing a treatment I would want to talk to different oncologists. I would talk to people that have been given a cancer diagnosis and have them advice me to talk to different doctors, and of the better treatment options that can be taken into consideration. Technology has advanced since October of 2001, the year O’Connor was diagnosed, and more has been learned about mesothelioma. Today there are other options that can be taken into consideration. First and foremost, I would try the best cancer treatment techniques if possible. I would try chemotherapy, radiation, and surgery. Many times, depending where the cancer is located, none of the three mentioned above can be used. In some cases that they do have a positive effect, nevertheless if they don’t I would have to expand my treatment options. Technology today has become more evolved. New treatments and new studies are being conducted to find a cure for this dreadful disease. According to the National Cancer Institute mesothelioma is extremely difficult to control. As a result, this organization conducts clinical trials with the hope to find effective treatments. I would go as a volunteer and get informed about the clinical trials and talk to my oncologist. Participating in clinical trials would not only help me meet other people, but it would give me different options. It would even suggest treatments that probably have not been written in journals, articles, or even internet sources. To me God is the center of all hope. When everything might be upside down, I believe that He has a purpose. I know this firsthand, coming from Colombia when I was 8 and having to face a new way of life, language, and culture. Even though that seemed like a negative aspect at the time, I realize now that the struggles that we faced as a family helped us become more united. Today my family is an important part of my life. I know that I can count on them if faced with the same challenge as O’Connor. I know that they would be there to support, pray, and encourage me. I also know that I could count on my fiancé. I know for a fact that he would go with me to the oncologist, research with me, and support me in every way that he could. I can count on him unconditionally. People that I go to church with would also be a great support system at the time. I would want to talk to each of them so that they could help me choose the best option. Even with the hardest and most devastating obstacles in life, there is hope. This is what I learned from the legacy that O’Connor left. Seeing a bright and hopeful future even when the evidence points to the contrary is a healthier way of living. Cancer has come to many families and has totally destroyed any chance for the future. Many people have accepted this fact, but I once heard a former classmate, “If I could smash anything, it would be cancer.” With education, encouragement, and a positive outlook for life, cancer can be smashed; at least for a few years. Since cancer can through remission. Not giving up and being committed to life to the fullest is a perfect example that James “Rhio” O’Connor demonstrated.